Design & Setup - Who say's your Wheelchair can't come? 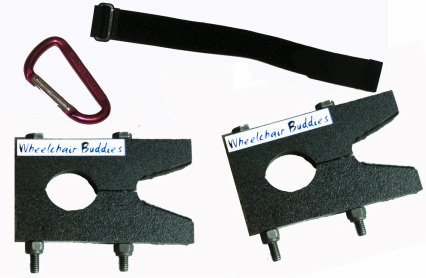 Wheelchair Buddies are a simple setup that attaches to your handcycle and allows you to bring your wheelchair along with you on rides! DESIGN - The theory behind the design was to create a hinge that attaches to the axle of the handcycle and can also attach to the crossbar of a wheelchair to mount the wheelchair on top of the handcycle. HOW IT WORKS - Once the wheelchair buddies have the wheelchair attached to the handcycle, the wheelchair buddies are rotated by pulling the wheelchair towards the rider, so the crossbar of the handcycle acts as a fulcrum and holds the weight of the wheelchair on top of the handcycle crossbar. 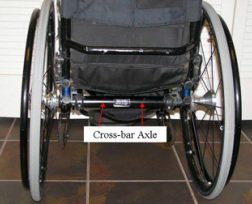 After the wheelchair is rotated over top of the handcycle crossbar, the wheelchair is latched, so it remains in that position. By doing it this way, none of the wheelchair (not even the castors) are touching the ground avoiding drag or bouncing every time there is a bump. To see just how easy it is to use, see the video on the next page! * Each set comes with 2 Wheelchair Buddies, one carabiner, and one strap. Here the WB1 model will slide into the anti-tipper slots of the wheelchair. 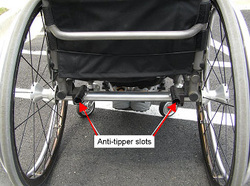 If there are no anti-tipper slots, but the wheelchair has frame end caps, remove them and attach the WB1 model. If neither of the first two options are possible, the WB2 model can attach to the wheelchair crossbar. Virtually every wheelchair has this. If you have anti-tipper slots or frame ends you should order WB1. 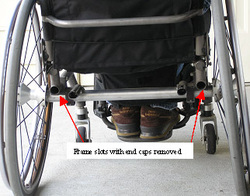 If you don't have either the anti-tipper slots nor frame ends, then you will need WB2, which attaches directly to the axle of your wheelchair.